I laugh every time I see this photo! 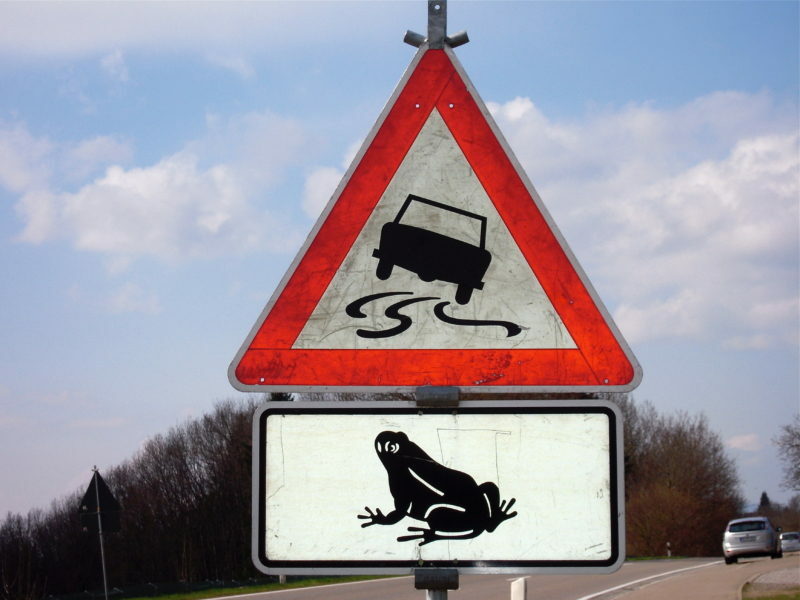 Who knew that frogs crossing the road was a problem???!!! When was the last time you flat-out laughed at the ridiculous, the absurd, or the quirky? We often get so enmeshed in our day-to-day lives that we forget to laugh. What causes you to laugh so hard that you can’t catch your breath or talk or have tears rolling down your face? Those laugh-out-loud moments often occur spontaneously and can be tricky to manufacture. One of the keys is to allow yourself to relish those moments when they happen, without trying to tone it down. In my family, we call those moments, knee slappers! What could you do to lighten your life, your work, or your relationships? What do you find flat out funny? Do more of that! The flip side of this process is noticing when you are being very serious. Where do you tone yourself down? You often shut down your ability to be creative when you are running on “serious” fuel. Cues that it is time to lighten the situation are when you feel burdened or overwhelmed. I can hear many of you thinking, but what about those really serious situations? Even in those situations, see if you can find something to chuckle about or at the very least, breathe! Play with this and notice what you find funny and when you are feeling very, very serious. Become aware of the quirky and humorous things in the world. Let yourself enjoy those moments. What have you discovered when you let more laughter into your life? Here is another sign that cracks me up every time! 2 Responses to Would You Like a Good Laugh? My bestie and I were on the phone while I was getting my guest room and bath ready for my sister’s visit. I am a Workabilily who has a place for everything and everything in its place and realized that the brown towel sets were missing from the linen closet. OMG!!! What will I do? That is certainly not where they should be, but we kept talking as I went to the place I was DEAD SURE they wouldn’t be….Guess What??? Isn’t it great to have a big, old laugh? Especially since it was so unexpected, not only that you would have put the towels in a different place, but that Bestie would guess where they were!